Everyone feel surprise that one of the youngest boy from poor family of nepal is going to make Record in Guinness World Record by climbing all Highest Mountain of the World. 23 years old Mr. Narbin Magar was Born in Basa VDC-9 Solukhumbu Nepal(Mapya Dudhkoshi Rural Municipality-2) . He has done many works to acquaint Nepal in tourism sector. Narbin has climbed highest Mountain of Four continent among seven continent of the world. He has climbed highest mountain of 4 continent within 180 days . Narbin was climbed World highest mountain of Nepal Mount Everest (Sagarmatha, 8848m) on 4th March 2018, Mount Kilimanjaro (5892M) of South Affirica in 4 August 2018,Mount Elbrus (5642M) of Europe on September 2018 and 2nd janaury 2019 he has climbed Aconcagua (6962M) . Narbin planned to climb Denaly of North America, Puncak Jaya of Indonesia and Mont Blanc of France till September 2019. in this way he is going to make glory by climbing all the highest mountain of all seven Continent. 9 years ago his father was in accident from that day all the Responsibilities goes in him. 14 years Narbin went to Lukla of Solukhumbu district to look for work. in the beginning he thought to earn money as a Porter and he got work in hotel. First time it tooks 9 days for his team to reach Mount Everest Base camp. He has studied only class 6 but he is fluent in writing and speaking English language due to experience of working with tourist and use of technology. In 2012 he came to Kathmandu and took tourist guid training after training he became a Tourist guid. 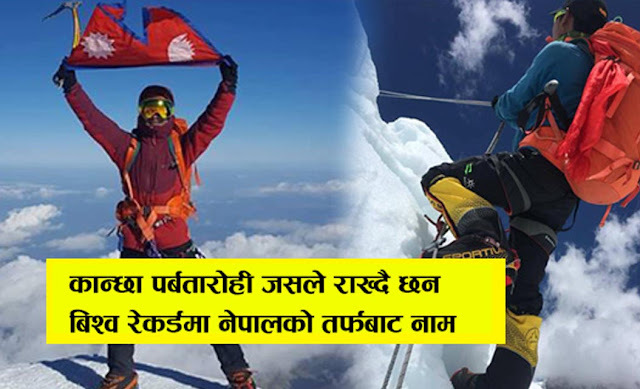 First of all he climbed Iceland peak of Solukhumbu Nepal. Till date he has climbed this mountian 9 times . it is not guarranty of life while climbing mountain but Stepped at the mountain peak felt extreme happiness shared Narbin Magar. His dream to reach summit of Mount Everest was fulfilled and later he dream to climb all the highest mountain of all seven continent. He is worry of snow lapped mountain because it may change in black hills so he climbed with campaign "Mount Preservation"
He was assembled to full fill his dream of Youngest climber by climbing all the highest mountain of all continent till comming July/August. >Karan Johar Requested to Prabash Debut in "Shuddhi"